This week, as hard commodities came under early pressure, participants may have asked themselves: 1. 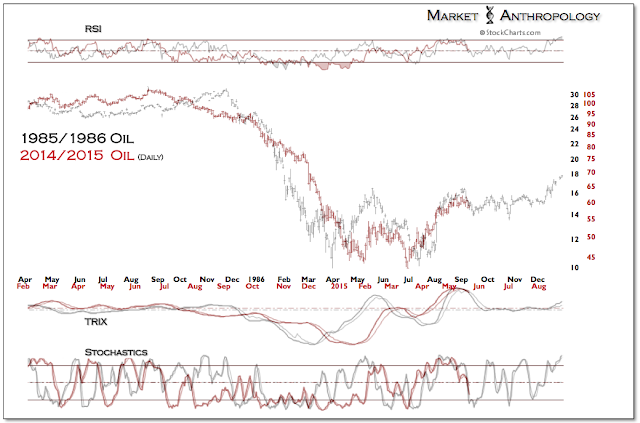 Is the rally over in oil, copper and precious metals; 2. 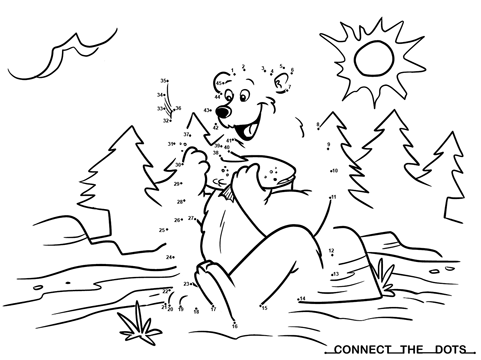 Was it just a dead cat bounce - or, 3. 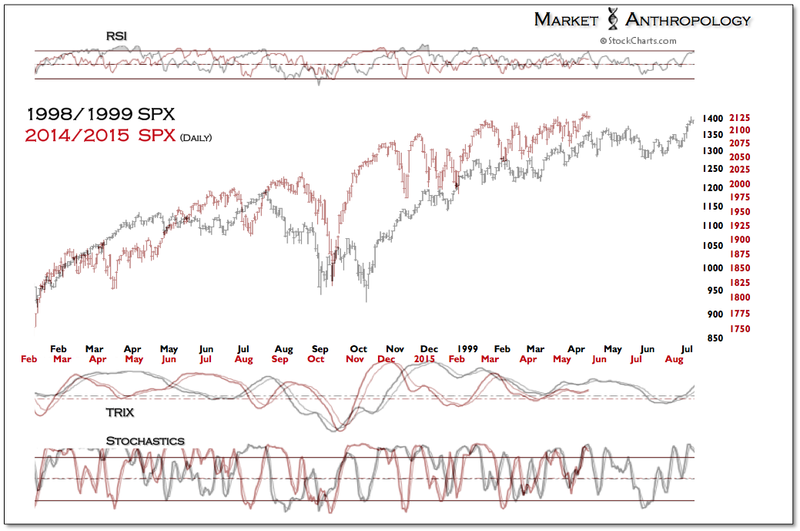 Has the tide truly turned and a new uptrend just begun? 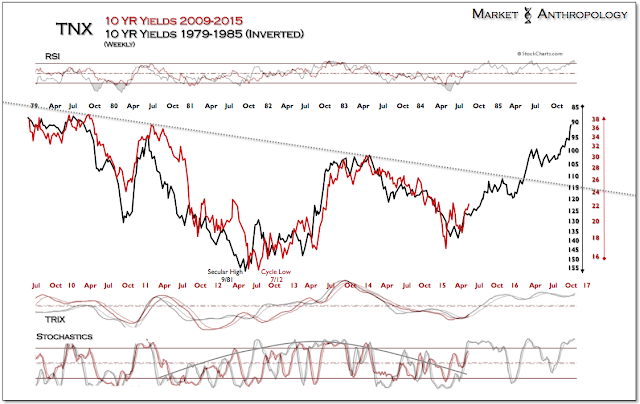 The same could be said with trends in yields and the euro - and conversely, in the US dollar index which bounced sharply through Wednesday's close. Generally speaking, these assets have trended from the same motivational influence, namely their respective susceptibility to inflation and inflation expectations, which invariably has been heavily affected by monetary policy - both here and abroad. 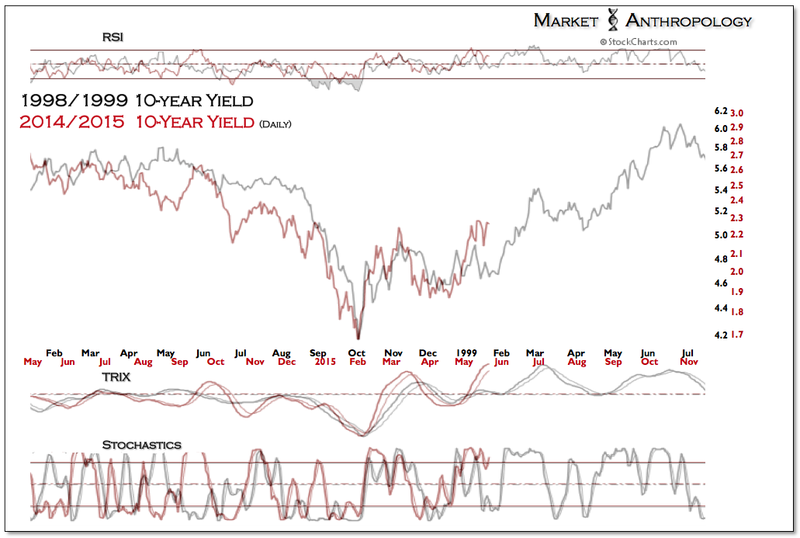 Our long-term macro perspective remains that there's a greater probability that real yields will ultimately fall again, as inflation rises out of a 2-year trough and with greater range than the reach of nominal yields. This development would support positions in hard commodities, which have remained under pressure since a strong disinflationary trend established in the back half of 2011 - as the ECB moved to tighten policy while the Fed continued its broadly accommodative stance. Over the course of the past year, both the Fed and the ECB have reversed their respective policy postures, easing the considerable torque built up in the currency markets that recently has begun to subside (Figures 16-18). 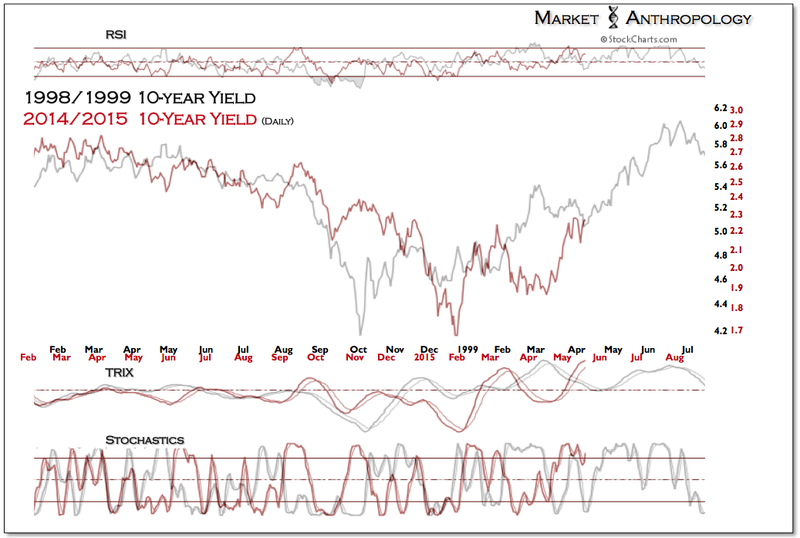 Although we're currently not bullish on the US or German government bond markets - and have leaned that way since the beginning of February, we maintain the opinion that the rise in yields will eventually be capped by the willingness of the Fed - and ultimately the economy, to sustain a rising rate environment. 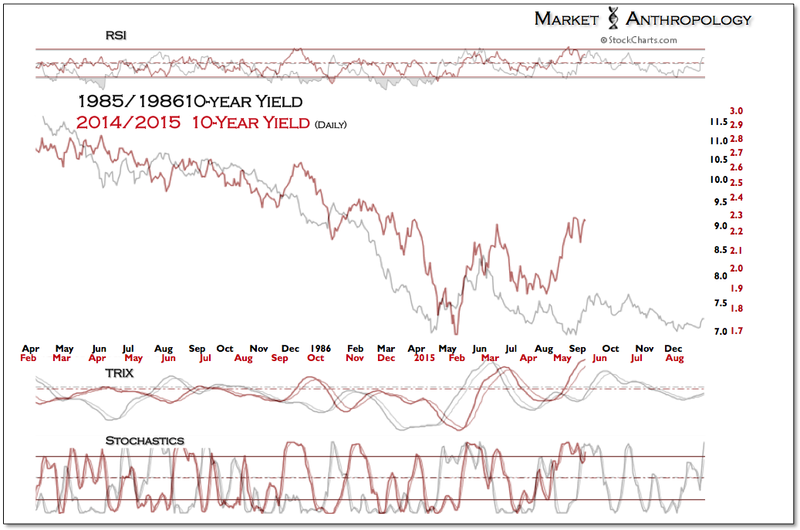 This perspective was guided by our research of the long-term yield cycle (see Here), that depicts a protracted and historically low range (e.g. 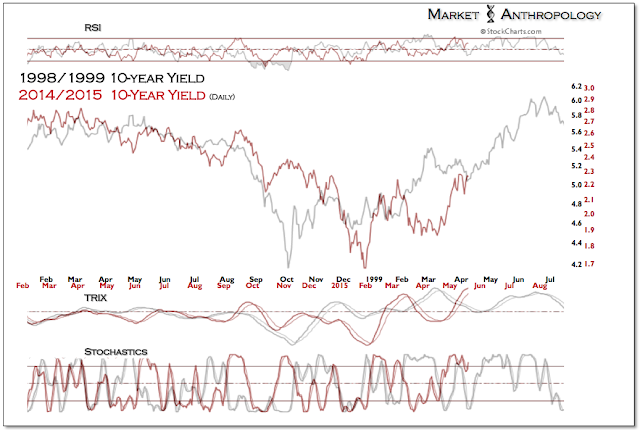 10-year yield between ~1.5 and ~3.0 percent), as markets normalize with a less accommodative Fed and the over six year bull market in equities loses greater momentum. All things considered, we expect similar dynamics to unfold this time across the trough and continue to view the 1946 cyclical high in equities as a prospective parallel with the current market. That said, over the intermediate-term we remain in the rising yield camp, with a natural target for the 10-year yield of testing long-term overhead resistance which would come in ~ 2.6 percent later this year (Figure 20). This is largely dependent on growth both here in the US and abroad, which we suspect will support a reflationary basket of positions as we look for the US dollar to retrace the large move extended over the past year. We continue to pan the US equity markets and would prefer certain Asian indexes along a longer-term timeframe, such as Japan's Nikkei and China's Shanghai Composite Index. 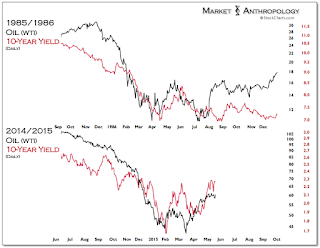 This is guided in part by our historic reads of the US equity and long-term yield cycles (Figure 19), which we'd speculate will become less supportive of stocks as disinflationary conditions abate and the Fed creeps forward towards further normalizing policy. 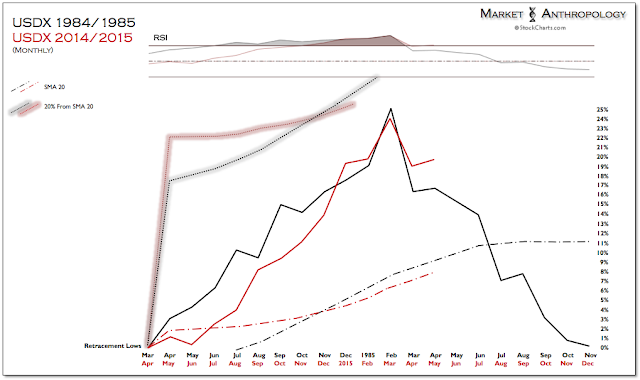 What upset the benevolent tide in the equity markets in 1946? The Fed and Treasury stepped away from their extraordinary support of the Treasury market and inflation found significant traction in the economy. 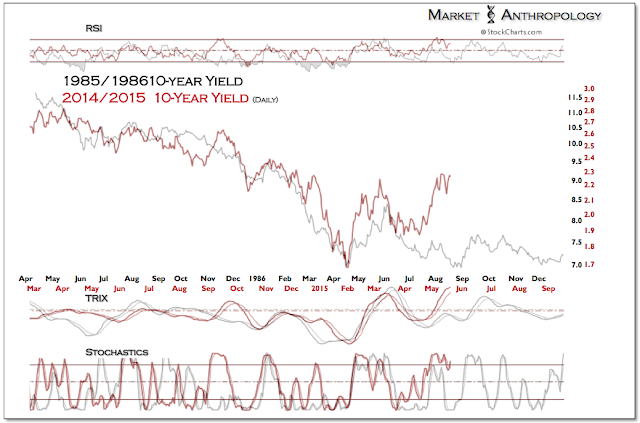 Interestingly, investors didn't flee the bond market as if inflation would maintain its trajectory higher, but sold equities and eventually took shelter in the perceived safe-haven shores of the Treasury market. Why? Because of what investors had lived through over the past two decades. 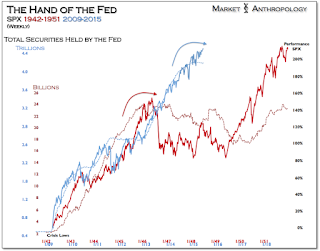 The Fed and Treasury might have succeeded at supporting the capital markets through considerable attenuating circumstances in the economy, but broader market psychologies were still entrenched and impaired from what participants had been through in the Great Depression. Milton Friedman and Anna Schwartz described these shifting market dynamics in A Monetary History of the United States. Today, as investors grapple with the more esoteric nature of monetary policy enacted in the trough of the long-term yield cycle, you'll find greater bi-polar reactions in the market and the media to economic data and various policy opinions within the Fed. 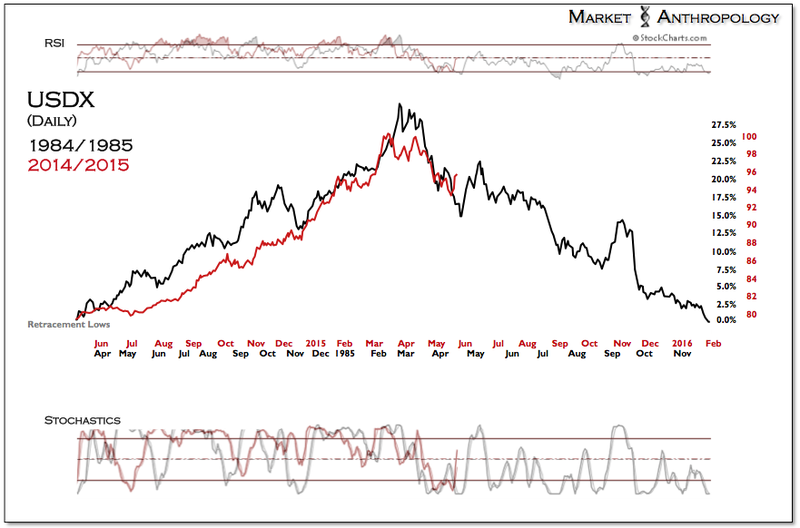 Ultimately, we suspect the Fed will continue to err on the side of caution, which over the long-term supports a reflationary strategy in the market that favors hard commodities - such as oil, precious metals and copper - over what strongly outperformed over the past six years, namely US equities. Over the short to intermediate-term, we'd expect that the largest tactical threats to this posture would come from a more hawkish tone from the Fed that would favor an earlier move towards raising rates here in the US - or a sustained downturn in the US economic data that could reignite broader disinflationary conditions. However, all things considered, we expect the Fed will walk a more deliberate policy path, as the economy continues to mend from the financial crisis and the magnitude of any potential tightening regime is realized to be far less than anticipated or witnessed in more recent Fed tightening cycles over the past several decades. We continue to closely follow the SPX:Oil ratio through a comparative prism of the two major exhaustion pivots (1986 & 1999) that make up the asymmetrical disinflationary/reflationary construct that the ratio represents. 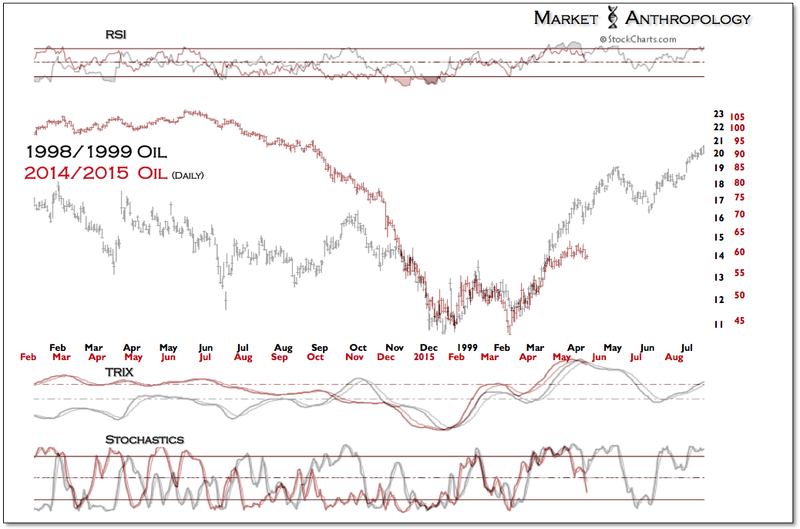 Although both timeframes depict market environments that saw oil outperform equities over the subsequent year, there were notable differences in the magnitude of the moves relating to various intermarket relationships - namely, inflation and policy expectations which greatly determined the direction of yields for the year. 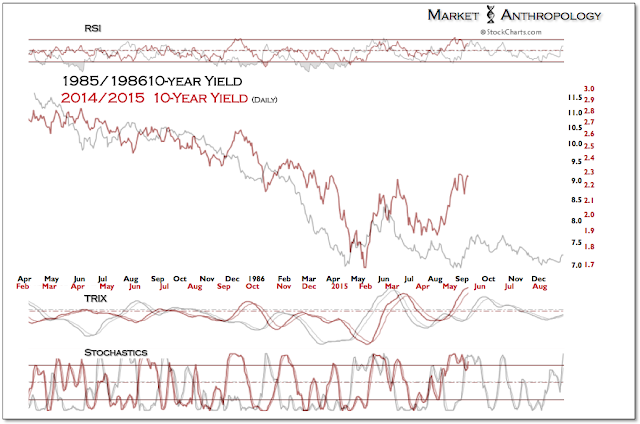 In 1986, yields troughed through the balance of the year as the Fed moved to further ease the fed funds rate as the economy slowed. 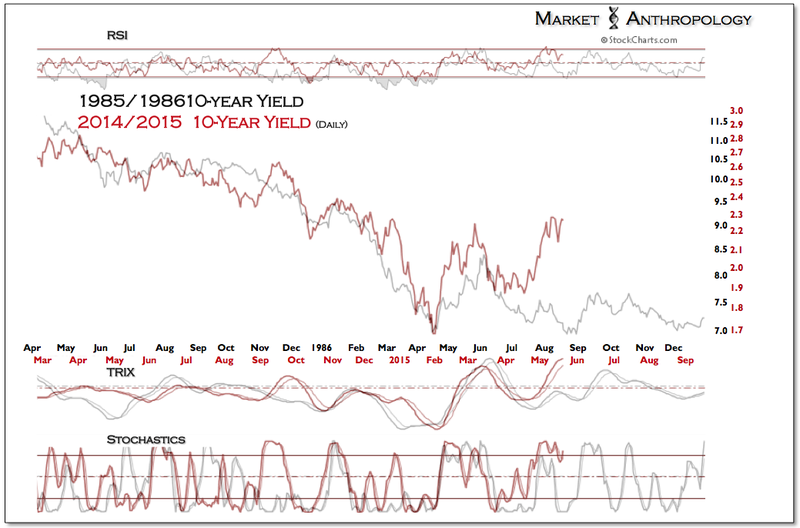 Conversely, in 1999 yields rose with oil throughout the year as the Fed began in June to tighten policy - eventually contributing to pricking the equity market cycle less than one year later. 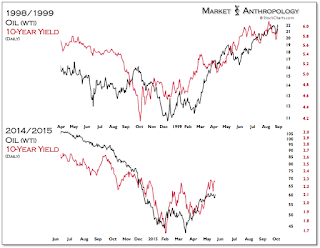 While the current relationship between oil and yields is more tightly correlated than both previous periods, we find greater similarities with 1999 - both with respect to Fed policy posture and the respective cyclical trends in the equity and commodity markets. 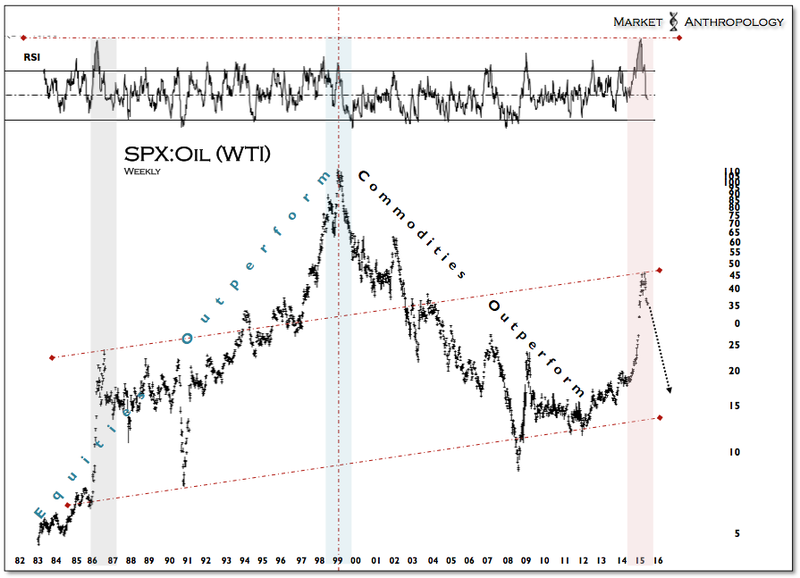 We included comparative updates for these periods that were normalized based on the respective exhaustion pivots of the SPX:Oil ratio. 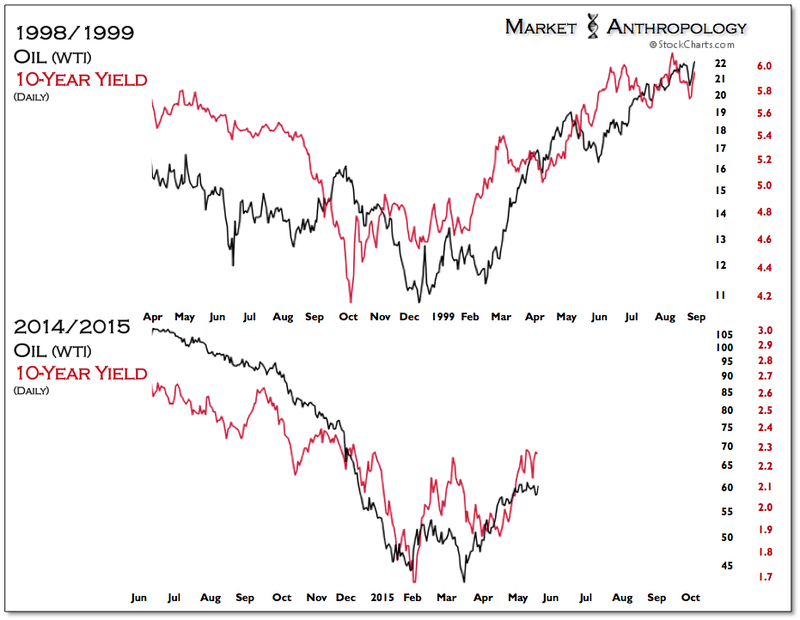 As shown above in the juxtaposition series between oil and yields (Figures 4-5), both 1986 and 1999 expressed lagged pivots between the two markets. 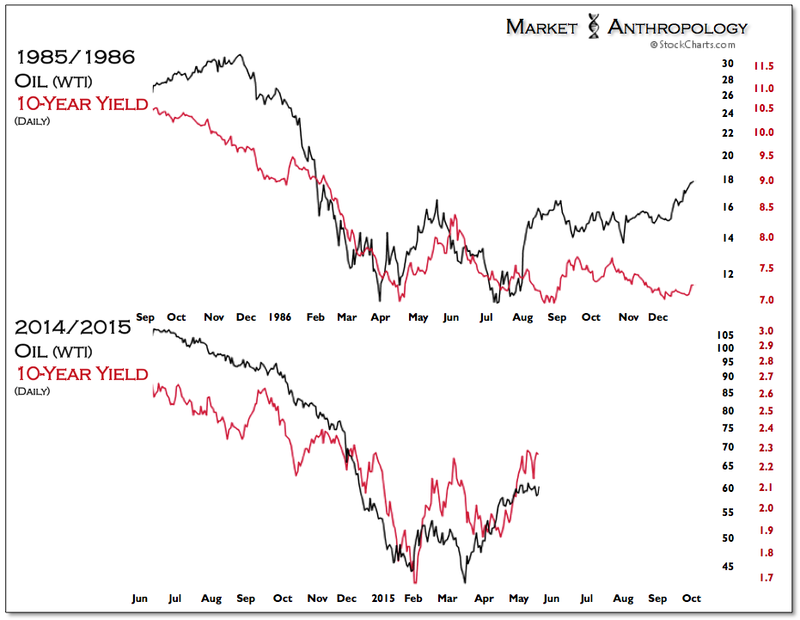 In 1986, oil set the final low 7 weeks before yields and in 1999, yields reversed 10 weeks before oil. 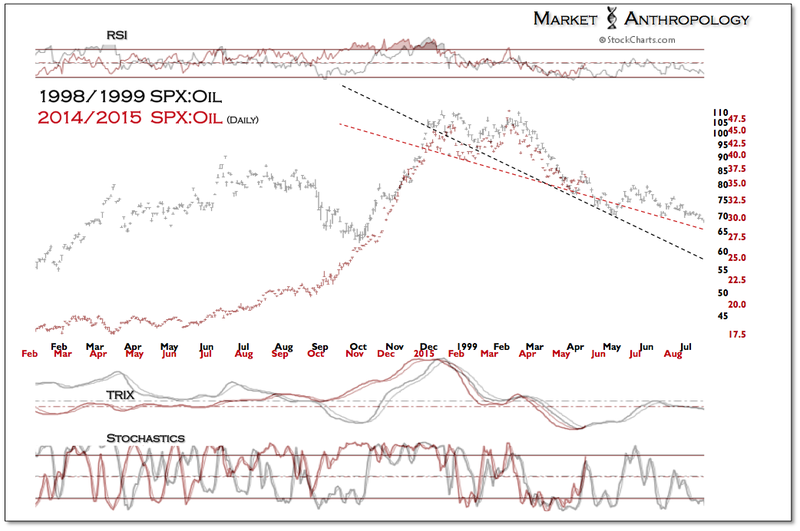 Measured along the same weekly timeframe, yields this year reversed 6 weeks before oil. 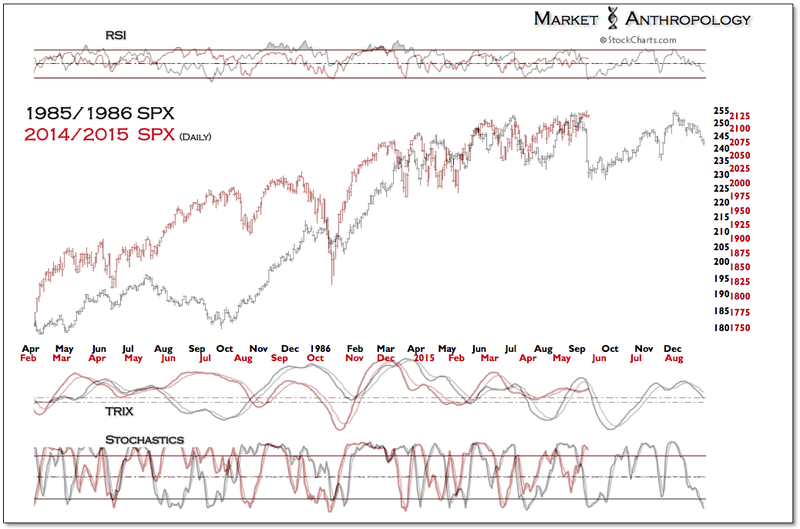 For comparison, the second series for each period was shifted to align with each low. 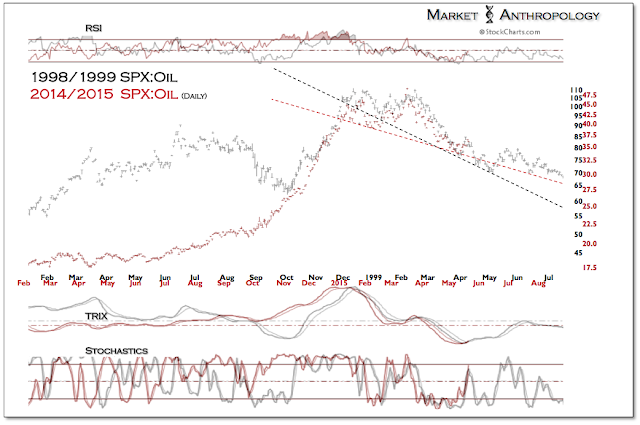 In summary, although we wouldn't dispute that markets will inevitably take their own distinct paths through history, current market conditions display the potential for a more long-term downtrend in the SPX:Oil ratio, as found with greater similarities to the move in yields, the respective equity and commodity market cycles and policy posture by the Fed in 1999. 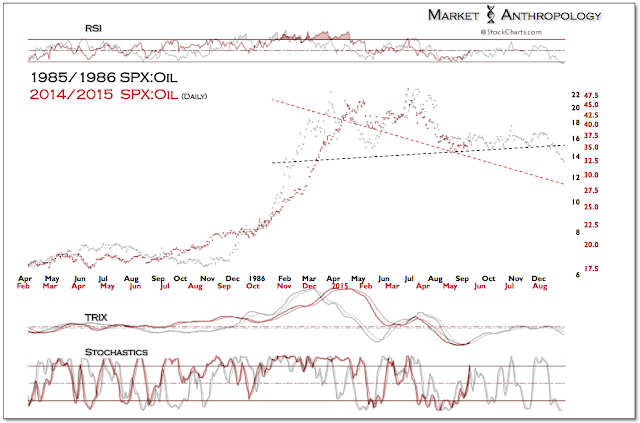 Moreover, we believe current market conditions reflect more of a cyclical pivot - rather than the secular variety that was translated in the commodity and equity markets in 1999 and 2000, respectively. 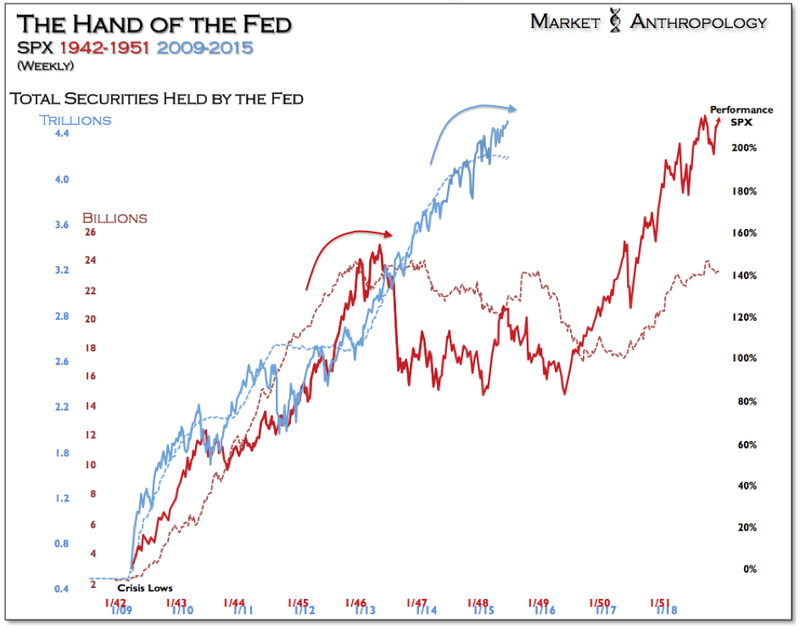 As such, we continue to find insightful market parallels, to the post depression/WWII era of the mid 1940's, where the Fed and Treasury slowly began to normalize policy after almost two decades of extraordinary intervention and support.